As we’re ending the school year, I know that the tween brains in my classroom are all silently deciding what information will be transferred to long-term memory and what will forever be taken out with the trash. To hopefully avoid your content being left to the dump, it’s really important that you help them reflect on what they learned and how they learned it. This one step can help ensure that more of your lessons and units are deeply embedded than deleted. So as we’re wrapping up the school year, I wanted to share a lesson that I do that helps my tweens reflect back on all that we have done together. It’s called the Epic Poem Haiku. 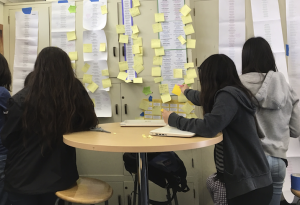 Part I of the assignment not only serves to embed the information more deeply, it also gives students a visual mirror of what they’ve accomplished. Part II of the assignment also gives me a sense of what had an impact on their learning so that I can improve my class from year-to-year. In other words, their reflection helps my own. Dog poop on shoe solved. Connect all of the stanzas together and submit. The due date of this assignment is Thursday, May 11. 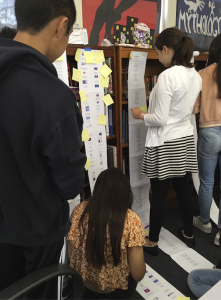 Once the students brought in the scrolls, we created a gallery walk around the room of the unraveled poems. Some of them could unscroll across the length of the room. 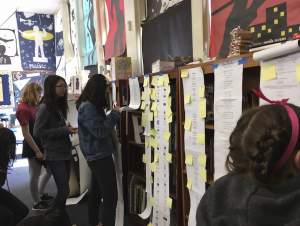 Students from different periods could write on the actual epic poem itself or slap-on post-its to comment on what they were reading. Thinking back on your collaborative epic haiku poem, create a visual graph of the school year assessing what engaged you the most. 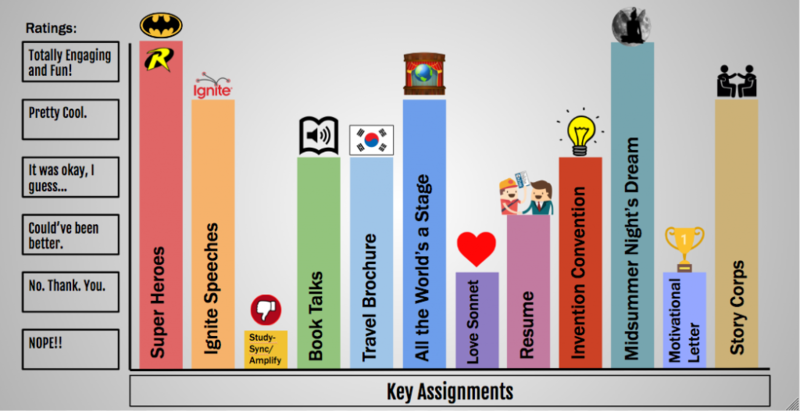 Select the key assignments (10-20) that you believe contributed to your learning this school year. 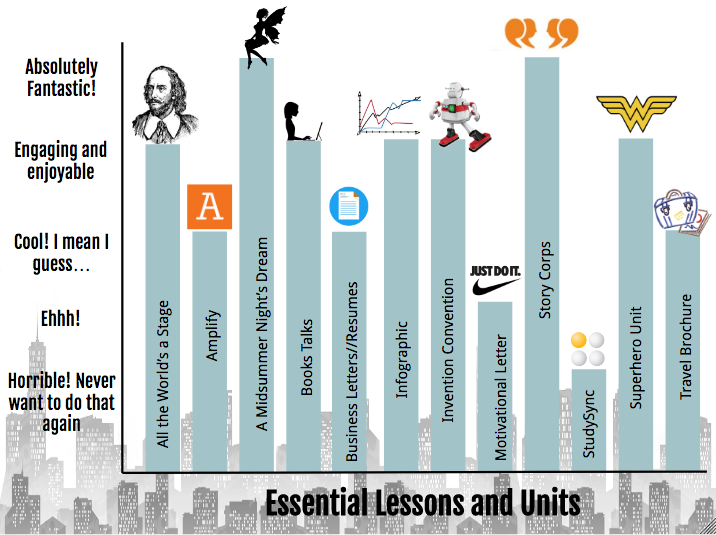 Create a bar graph that visually displays the lessons/units that you found most engaging and/or effective. Create a symbol of your own learning to represent the year and use that on the bar graph itself. On the X-axis of your bar graph must be the lesson titles. On the Y-axis of your graph, you need to produce a list of words to describe the engagement level of the lesson. Words to describe your engagement level might be anything from “dull” to “exhilarating!” Your choice! If you are using icons or symbols that are not of your own design, you must also submit a Works Cited on a separate document. This assignment is due Monday, May 22. Look, there is a time and place for Project Based Learning, but there’s also the time for a simple project. 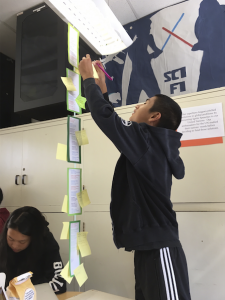 I believe that a perfect way to spend one of those classroom days at the end of the year is on a project that’s focused on reflection and metacognition. As we approach the end of the year, complete with its grade level field trips, carnivals, awards lunches, and promotion practices, it’s important to make every stand-alone day count. Have kids look back at the year using an academic lens. Have kids acknowledge and create something based on what they’ve accomplished. You’ll find they remember your classroom community even long after their mortarboard hat has been tossed into the air. seo outsource - seo outsource Contract the amazing seo firm that's now available and reasonably priced today! seo outsource company - seo outsource company Get Services From the fantastic wordpress blogs that is now available and on sale today! outsource seo - outsource seo Get Services From the wonderful video production that's now available and on sale today! wordpress plugins - wordpress plugins Contract the wonderful search engine optimization company that's currently available and reasonably priced today! seo outsourcing services - seo outsourcing services Get service from the amazing online marketing currently currently available and at the best price today! seo outsourcing service - seo outsourcing service Get Services From the wonderful ppc outsourcing that's now available and at great prices today!